Finding street side gudeg may be gampang gampang susah in Jakarta. It’s easy if you know specific places like perhaps in Cikini or nearby my old office in Jalan Sudirman (believe me, I don’t know anywhere else back then). But if not, you’ll be forced to eat whatever street food you can get on any given neighborhood. I was lucky to be introduced with Ibu Tinah’s gudeg by our young and vigorous chef/food writer Kevindra Soemantri some time ago. Bu Tinah has been offering her gudeg basah (which perhaps she pronounced it wrong as gudeg Jogja – typically dried, not wet like hers) since 1974. The wet type came from Solo apparently. According to the chef, it is an understandable “mistake” since back then when she started the business since gudeg was more commonly known as gudeg Jogja. I’d like to tell the story more but I’ll keep it secret for now and until I publish it in the magazine which is pretty much soon I hope. In the meantime, please enjoy that mouthwatering, complete gudeg offering with krecek, opor ayam, hard boiled egg, and sambal topped over a bed full of rice! It’s wholesomeness would be something that you won’t be able to resist having for lunch! Stay tune until my next post about it! Wowww so mouth watering! I am drooling! I also prefer gudeg basah to gudeg kering. Gudeg kering is too sweet, even for my Javanese tongue. 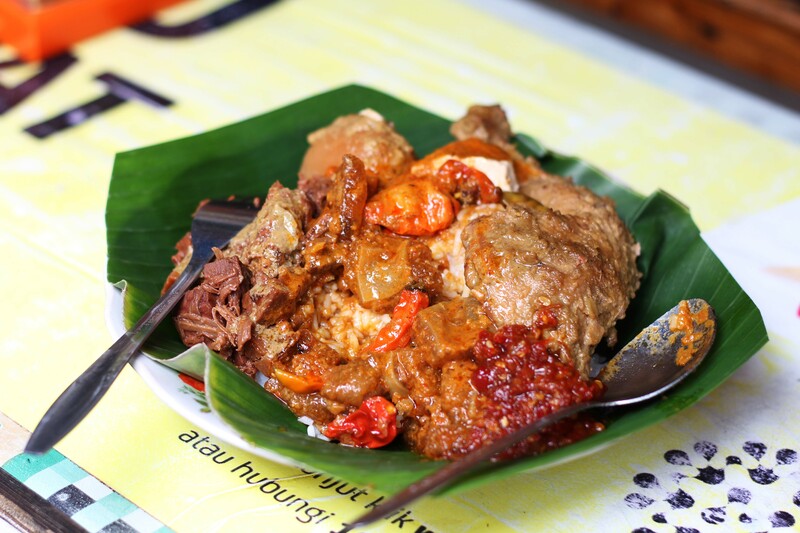 Have u tried gudeg pawon in Jogja?